All three perpendicular bisectors of the sides of a triangle will intersect at the same point - the circumcenter. Let the circumcenter be point C in your diagram. 1) Do all of the perpendicular bisectors meet at a single point? ﻿(Drag the vertices of the triangle to create a variety of triangles to check if this is always true) 2) Will the circumcenter always be located inside of the triangle? Why or why not? 3) What can you conclude about the location of the circumcenter based on the type of triangle? 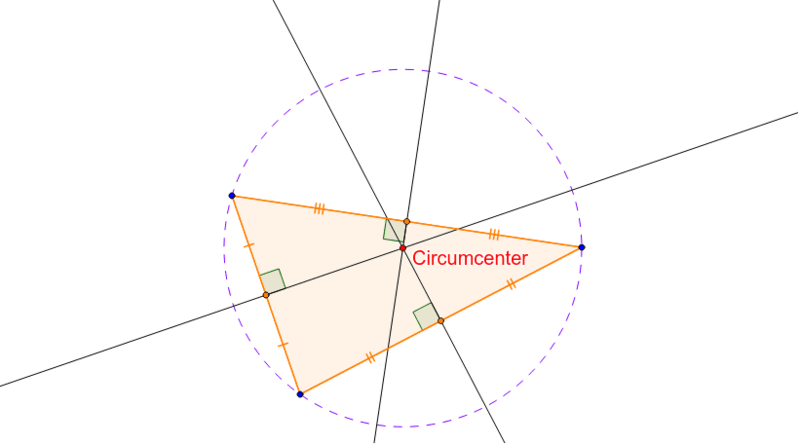 4) The circumcenter is the center of the circle that circumscribes the triangle. What does it mean for a triangle to be circumscribed in a circle? 5) How would you describe, in words, the length of the radius of the circle that the triangle is circumscribed in?